The Arctic Fox is an animal that loves the chilly winters around Churchill, Manitoba as he walks across the icy tundra while we snap his picture. Out on an adventure, this Arctic Fox makes his way across the frozen waters of the Hudson Bay in Churchill, Manitoba which is a simple feat for this animal to conquer. Their paws are padded with thick fur making walking across the ice and frozen tundra of Churchill very easy and natural for them. Every winter, the Arctic Fox has a coat of snowy white colored fur so that they blend in with the surroundings of the landscape to protect them from any predators. As summer approaches, their fur changes to grayish brown, once again for camouflage reasons. Looking closely at this picture, there is still a grayish hue mixed with the white coloring on this Arctic Fox. 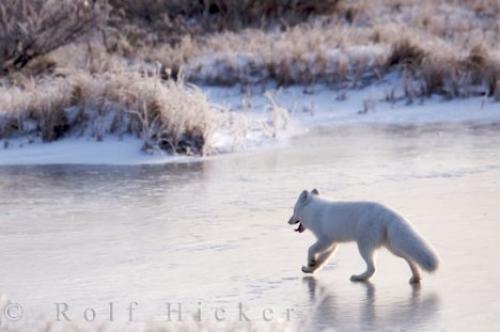 Photo of an Arctic Fox making his way across the ice in the Hudson Bay area of Churchill, Manitoba in Canada. The Arctic Fox is an animal which prefers the colder climates and your chances of capturing a picture of an Arctic Fox are much better in the winter around Churchill, Manitoba. They move around very sleekly and are much livelier at this time of year but can be very hard to distinguish in the snow. At times you can find an Arctic Fox floating aimlessly aboard an ice floe in search of food and this is a very unique time to take a picture. Arctic Fox, Alopex lagopus, on the icy tundra of Hudson Bay, Churchill, Manitoba, Canada. I photographed this photo with the digital SLR camera model Canon EOS-1Ds Mark II, aperture of f/6.3, exposure time of 1/500 sec. on ISO 100, as always I used a original Canon Lens, the focus lenght for this picture was 310mm.